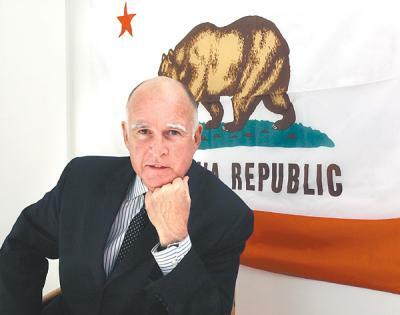 Don't look now, my fellow Californians, but it's official: Governor Moonbeam is back. If elected, Brown will win an historic third gubernatorial term after having served two terms as governor from 1975 to 1983. His father Pat Brown also served two terms as California's governor. Brown faces no Democratic challenger. The most likely candidate, San Francisco Mayor Gavin Newsom dropped out of the race, ostensibly because his fundraising was inadequate to face the Republican challengers, the very wealthy Meg Whitman and Steve Poizner. Brown can seek this third term because term limits had not been enacted at the time he was previously Governor, so therefore do not apply. I'm a big fan of Jerry Brown, the man as well as the politician. How refreshing to have an unapologetic liberal running after years of Republican rule and a ridiculously hamstrung legislature. Brown has done a very good job as our state Attorney General (one of many public service positions he's held in his life). But I don't know if he has the nest egg of funding that Whitman and Poizner have, so if you'd like to donate to his campaign, you may do so here.